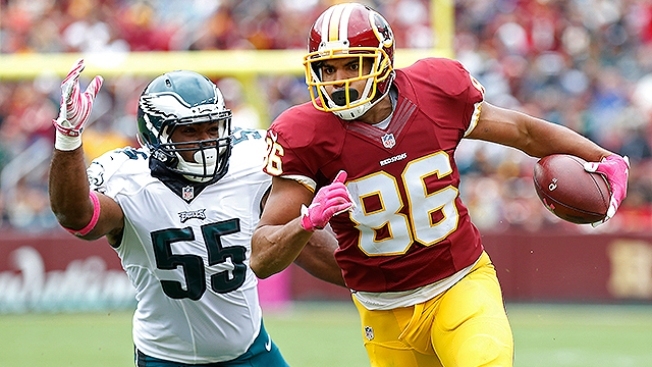 Jordan Reed back on the field and healthy could be just what the Washington Redskins' so-far stagnant offense needs. Reed practiced for the first time this preseason Wednesday and called himself 100 percent after missing almost a month with a toe injury. The absence of quarterback Kirk Cousins' most consistent and effective target was noticeable in two games, and now the Redskins will get to see what they can do with Reed healthy. "He is a critical part of our offense," coach Jay Gruden said. "It is a comfort level when he's in there. There's a lot of things that he can do that not many people can do at the tight end position." At 6-foot-2 and 242 pounds and with a strong blend of speed, athleticism, footwork and hands, Reed is a matchup nightmare for opponents. He's too big for most safeties to handle and too fast for most linebackers to keep up with. Since he became a full-time starter two years ago, only injuries have managed to slow down Reed, who had 66 catches for 686 yards and six touchdowns in 12 games last season. Washington's offense runs through Reed -- and with good reason. "Jordan has unique movement skills and then because he's often lined up in a way where he's being covered by safeties and linebackers and nickel corners, he creates matchup issues," Cousins said. "We're always looking for those matchup advantages and they tend to be in Jordan's favor just because of how uniquely gifted he is." Cousins is working with a couple of new receivers as Terrelle Pryor and Josh Doctson are replacing DeSean Jackson and Pierre Garcon, but Reed is a constant and a safety net. The 27-year-old was targeted 91 times last season despite missing four games with a concussion and shoulder injuries, and his presence allows fellow tight ends Vernon Davis and Niles Paul to be used in more advantageous positions. But to make all that work, Reed had to get healthy. An injury to the big toe on his left foot lingered since last season and caused him to begin training camp on the physically unable to perform list. Reed was examined by a specialist and recently started using wider shoes and orthotics to help alleviate the soreness. The progress allowed him to be a full participant in practice. "The orthotics in the cleats have been working really good for me," said Reed, who doesn't expect the injury to affect him during the season. "I go out there, I try to do my best, prepare myself before practice so I can just go out there and play and not have to think about it." Gruden said Reed could play Sunday when the Redskins host the Cincinnati Bengals in their third preseason game, traditionally a dress rehearsal for the regular season. Reed considers it very important to get some exhibition action before the season opens Sept. 10 against the Philadelphia Eagles, but Gruden doesn't consider it a must. "I'd like to get him back out there, get in the running game a little bit, get involved and obviously catch a couple passes," Gruden said. "But if he's not feeling up to it at that time on Sunday afternoon, then so be it. I think Jordan's the type of guy that has missed time before and come back and not missed a beat. He's just one of those freakish guys that has the luxury of doing that." Washington's first-team offense had two three-and-outs in the preseason opener at Baltimore and put up 154 yards in 34 plays Saturday against Green Bay. The running game in particular has struggled, but any concern about Cousins and the offense has to include the caveat that Reed and other players haven't been on the field. With Reed, Doctson and Jamison Crowder all back, the Redskins finally have their full complement of offensive skill players. "We haven't had many days where the whole group is together," Cousins said. "This felt like the first day, not only to have Jordan in place but to really have what we think is our offense at least to start the season." NOTES: LB Junior Galette (hamstring) returned to practice but was limited. ... C Spencer Long had a knee scope, though Gruden expects him to be ready for Week 1. Rookie sixth-round pick Chase Roullier took his spot with the first team. The Redskins late Wednesday acquired rookie C Lucas Crowley from the Pittsburgh Steelers for CB Dashaun Phillips. ... Rookie LB Ryan Anderson (stinger) remains limited.